The duck breast was perfectly cooked. The richness of the meat served with a pork sauce was cut by the sharp bite of sautéed red cabbage. Small pearls of parmesan gnocchi and steamed vegetables circled the dish. 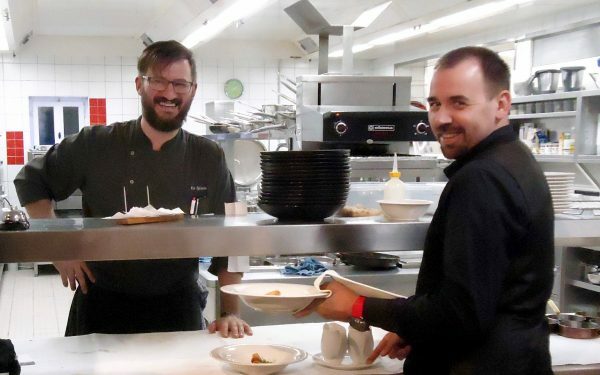 We were in the ancient kitchens of the 11th-century Neuburg Castle, now Chef Klaus Eglseder’s Hoftaferne Restaurant located just outside the storybook town of Passau. That’s where we began our four-day exploration of Southern Germany’s culinary traditions, from Bavaria in the southeast to Swabia in the southwest. 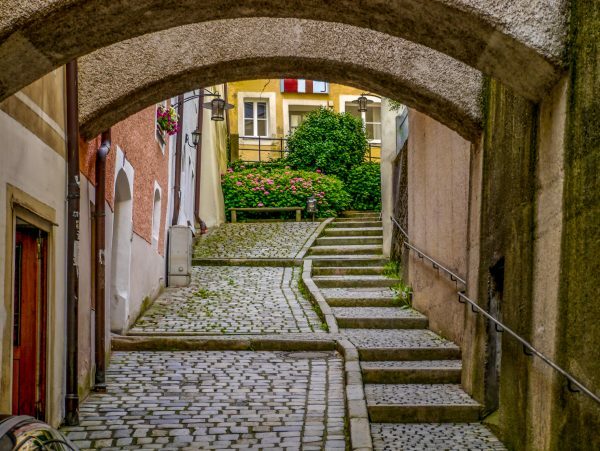 Our first adventure was a progressive dinner starting in a historic Passau brewery and ending at a student hot spot where surprising culinary inventions were taking place. 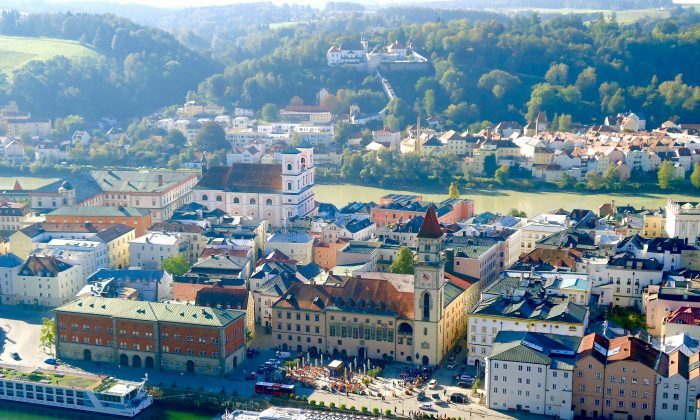 Passau began as a Roman town dominating the trade routes at the confluence of three rivers—the Inn, the Ilz, and the Danube—and its history includes a growing commitment to sustainable farm-to-table cookery. Our evening began in the former halls of Peschl Brewery where a taster platter of traditional southern Bavarian foods started us off with dishes like cold potatoes mashed with cheese, pork in aspic, and obatzda (a cheese spread made with Camembert, cream cheese, butter, onions, and beer). At our next stop, the table turned toward contemporary cooking at the Bistro Innsteg on the Inn River. Young chef Alois Zwislsberger created a plate of beef carpaccio so tender it melted in my mouth. Served under flecks of shaved parmesan, it was paired with sautéed porcini mushrooms picked fresh that day from the surrounding forest. With the accompaniment of an Austrian Zweigelt rosé, the flavors were simple and fresh. Leaving the Bistro Innsteg, we walked across the bridge over the Inn River, with Passau’s massive copper-capped Dom looming above us, arriving at Journey, a student hang-out and bar with a surprising chef named Hubert Scheungraber. While alcoholic specialties abound at Journey, chef Scheungraber created three desserts just for us: a sorbet flavored with limoncello liqueur, chocolate cake with whiskey from the Bavarian forest, and pane cotto with apricot liqueur. It was a surprising evening with a mix of styles typical of a town that houses 12,000 university students and draws influences from the nearby Czech Republic and Austria. Dinner in Passau may have been memorable but the “imperial breakfast” presented the next day at Café Anton, under the eye of chef Anton Aschenbrenner, was superb. A three-tiered serving tray filled with fresh fruit and yoghurt, bakery delicacies, homemade jams, prosciutto and local cheeses served with freshly squeezed orange juice, and freshly brewed coffee put us in a mellow state of mind as we set off on our train ride to Nuremberg. In 1971, Nuremberg celebrated the 500th birthday of famed resident artist Albrecht Durer by building an artisans’ courtyard inside the city walls. Meant to recreate the marketplace of medieval Nuremberg food offerings reflect the period but are still the fast food of Germany today. At Behringer’s Bratwurstglocklein, grilled Nuremberg bratwurst in a crusty bakery roll served with mustard and a glass of Zirndorfer lager beer is still, as it was in Durer’s day, the food of the countryside. 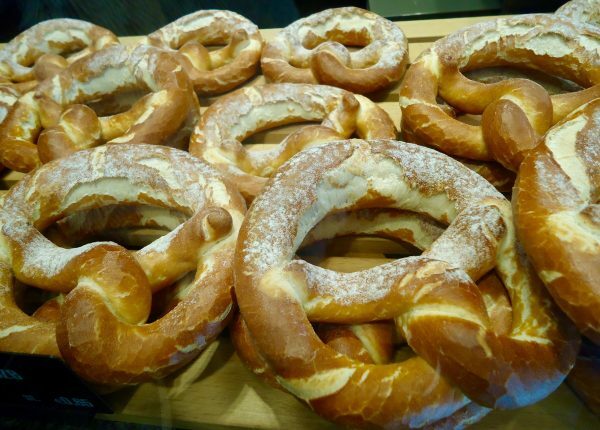 Two other traditional foods offerings known throughout Nuremberg are pretzels and gingerbread. The grip of the gingerbread bakers on medieval trade was so great that no one was allowed to open a bakery without belonging to their company. An ambitious man could marry a baker’s daughter and so succeed to the lucrative trade, and according to legend, there were plenty of suitors. Nuremberg also excels in its attractive sidewalk cafés and in an extensive open-air market where local and exotic fruits and vegetables are on display. In 2018, Stuttgart celebrated the 200th anniversary of its fall festival, the Cannstatter Volksfest. Back in 1815, the Tambora volcano exploded in Indonesia and sent layers of ash and dust around the world, destroying the harvests in Europe. Three years later, King Wilhelm of Wurttemberg inaugurated the festival to celebrate the first year of successful harvests after the catastrophe. Located just outside the city, the Cannstatter Volksfest is a giant funfair punctuated by beer tents that welcome four million people over a three-week period. 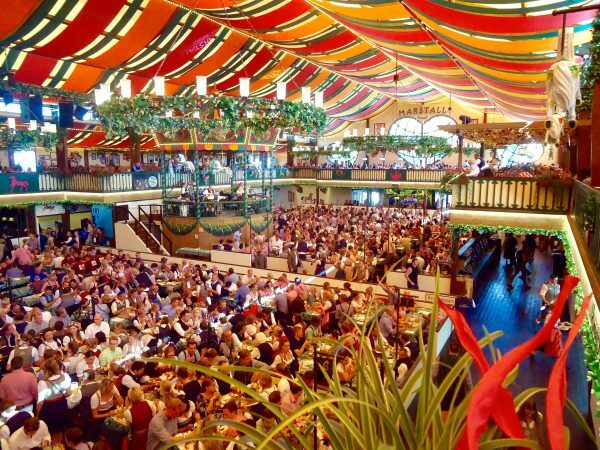 Stuttgart’s slightly older, bigger cousin is Munich’s Oktoberfest, where millions of liters of beer are consumed by nearly eight million people. Local dress—dirndls for ladies and lederhosen for men—is almost a requirement. During our visit to Munich, we attended Oktoberfest. As we entered our tent a lavish display of prosciutto, ham, cheese, obatzda, and sausage all topped by a beautiful bunch of bright red radishes dressed the table. Giant pretzels were available for diners to break off and scoop up the cold cuts. I could have made a meal of this alone, but it was just the starter. As the Bavarian oompah band blasted above us, dinner service arrived on the stalwart shoulders of a sturdy waiter. The massive plates of delicately breaded veal (wiener schnitzel) served with a squirt of lemon juice and a dab of cranberry sauce together with a heaping mound of potato salad flourished with cucumber frills would have quenched the appetite of any German Paul Bunyan. Liters of Munich beer flowed freely and it wasn’t long before diners were dancing on the tables, dirndls whirling and lederhosen swaying, swinging steins and singing with the band. Outside, whirligigs and roller-coasters swooped around the midway. Oktoberfest may not offer cutting-edge culinary art but its take on traditional cooking and endless supplies of beer can’t be topped. Prost! Susan James is a freelance writer based in Los Angeles. She has lived in India, the U.K., and Hawaii, and writes about travel, art, and culture. Germany's Cannstatter Volkfest is the second largest beer festival in the world after Oktoberfest, with 4 million annual visitors.